When it comes to coral health, superoxide—a natural toxin all oxygen-breathing organisms produce—gets a bad rap. Scientists have called superoxide out as the main culprit behind coral bleaching: The idea is that as this toxin builds up inside coral cells, the corals fight back by ejecting the tiny energy- and color-producing algae living inside them. In doing so, they lose their vibrancy, turn a sickly white, and are left weak, damaged, and vulnerable to disease. Now, a new study from the Woods Hole Oceanographic Institution (WHOI) is casting a more positive light on superoxide. It suggests that when these molecules are produced at coral surfaces—outside of their cells—they may actually play a beneficial role in coral health and resilience. The research that results from this finding may contribute to future strategies for preventing corals from bleaching. 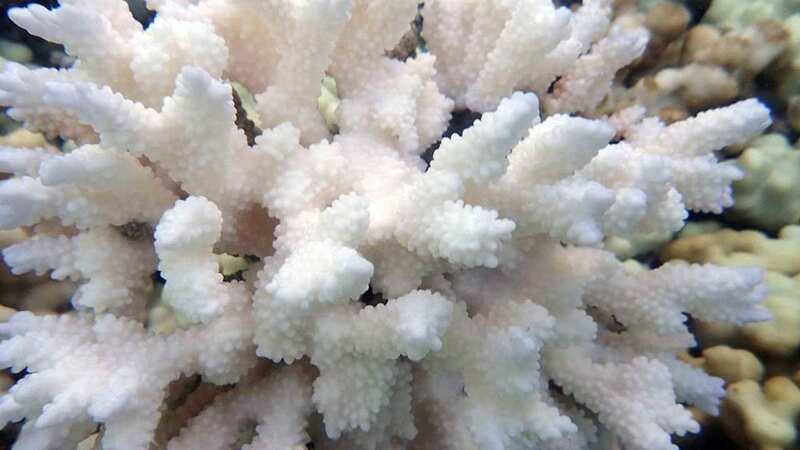 Hansel said the researchers were surprised to see that, during the bleaching event, coral species that were more susceptible to bleaching weren’t producing external superoxide, while those that resisted bleaching produced high concentrations. “While we don’t yet understand how corals produce superoxide externally, this discovery points to a fundamental misunderstanding of what this group of compounds does for coral health,” she said. 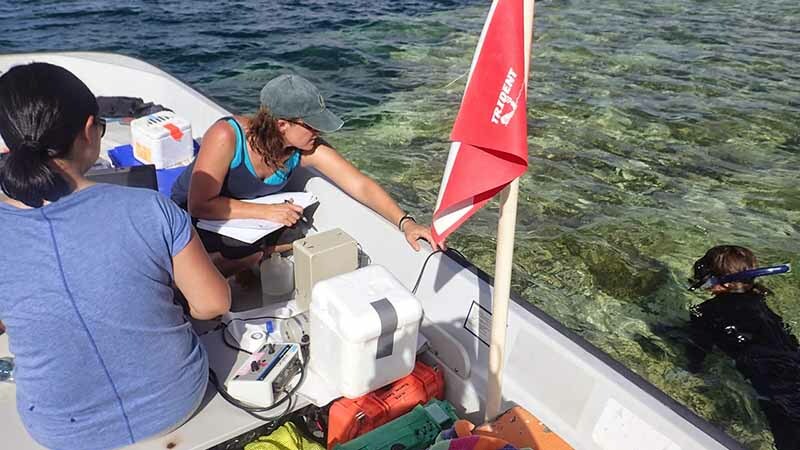 To overcome this, she and her research team devised a novel approach for taking real-time measurements of coral superoxide production in a natural reef environment. During a week-long field visit to Hawaii’s Kaneohe Bay in October, 2014, they lugged a laboratory instrument used for superoxide analysis onto a tiny motor boat and took samples from six different shallow reef sites. WHOI microbiologist Amy Apprill was underwater holding the sampling tube in place as her colleagues “shouted out with excitement from seeing the real-time data.” Apprill said it was amazing to see wide variations in superoxide production among different coral species, some making “a ton” of superoxide, while others making very little. Their analysis showed the corals producing more superoxide had greater resilience to bleaching than the coral producing very little. Another noteworthy discovery, according to the scientists, was that corals were producing superoxide even when there were no evident stressors, such as hotter seas, which are known to trigger superoxide production. In a parallel study published November 24 in the journal Frontiers in Marine Science, the team found similar results with corals grown under non-stressful conditions in the lab. The corals, and their microbial partners (symbionts), produced high levels of superoxide at the surface independent of temperature and other variables such as time of day or presence of light. The possibility that superoxide may help corals resist bleaching was eye opening for the scientists, but it isn’t the first time these toxins have proven beneficial to organisms. In fact, research conducted on bacteria and fungi has shown that superoxide is purposely made outside the cell to stimulate cell growth, increase nutrient uptake, and fend off invasive pathogens. Understanding the positive impacts of superoxide on corals may be a stepping stone towards improving coral health and developing bleaching mitigation strategies in the future—particularly if the molecules are in fact protecting corals from stress rather than inducing it. The information could ultimately be used to help determine how to engineer corals to be more resilient. But Hansel feels more work is needed. Hansel said that while the fieldwork made it possible to explore corals in a natural environment that is more realistic to the conditions they experience, lab experiments allow them to change one variable at a time while keeping everything else constant so direct relationships can more easily be seen. “To truly link variables like heat and stress, we need to minimize variability in other variables, like light, changes in flow patterns, and nutrient inputs,” she said. 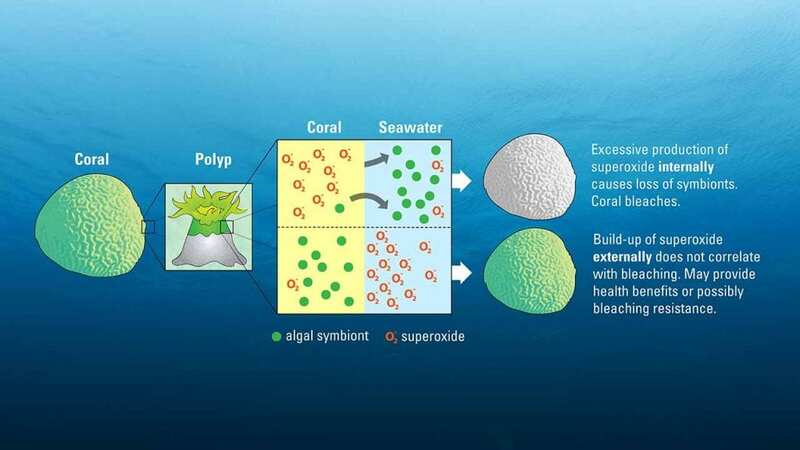 According to Apprill, the new findings suggest that superoxide may play a variety of roles in coral health, and have led to a new realization of the complexities the toxins play in corals. This research was funded by the National Science Foundation, the Sidney Stern Memorial Trust, the Ocean and Climate Change Institute of the Woods Hole Oceanographic Institution, and an anonymous donor.